Member of Conneaut Charter Boat Assoc. long. 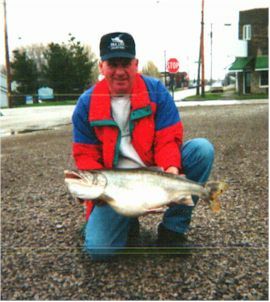 It is the Ohio State record for lake trout. 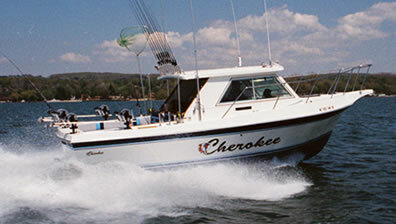 "The Sea Lee" is a 30' Cherokee hardtop with a cuddy cabin and privacy head. Equipped with an auto-pilot, 48 mile radar, VHF ship to shore radio, Loran C, GPS, Furuno fishfinder, outriggers, downriggers, and planer boards. Powered by dual 350 crusader engines. Featuring all United States Coast Guard approved safety equipment. Captain Tom Harbison is a fully insured United States Coast Guard captain. Member of the Conneaut Charter Boat Association, Captain Tom has 10 years of experience fishing Lake Erie's Central and Eastern basins. The Lakefront Motel offers lodging within walking distance of Conneaut Harbor. Visit their website at www.lakefrontmotel.com for rates and more information.